The liver is a site where activated CD8+ T cells are trapped and destroyed at the end of an immune response. The intrahepatic accumulation of activated murine TCR transgenic CD8+ T cells was significantly reduced when either ICAM-1 or VCAM-1 was blocked by specific Ab. These two adhesion mechanisms account for essentially all the trapping of activated CD8+ T cells in the mouse liver. Although the ICAM-1-mediated trapping depends on the capacity of the vasculature and/or the parenchymal cells to present Ag, the accumulation of cells through VCAM-1 does not require Ag recognition. Thus, Ags expressed by the non-bone marrow-derived cells in the liver actively cause CD8+ T cell accumulation through TCR-activated ICAM-1 adhesion, but the liver can also passively sequester activated CD8+ T cells that do not recognize intrahepatic Ag, through VCAM-1 adhesion. Upon activation T cells migrate from the lymphoid organs into peripheral tissues and into sites of infection. In addition to its role in clearing pathogens, the localization of activated cells in different peripheral compartments has implications for the nature of signals that these cells receive locally, which affects their survival and the generation of memory responses (1, 2). Different experimental models that examined the fate of activated CD8+ T cells in vivo showed that after systemic activation, there was migration of these cells to the liver, where they were trapped and eventually killed (3, 4). This phenomenon has been seen with different activating stimuli, including antigenic peptide, anti-CD3 Ab, and influenza virus infection (5, 6, 7, 8), suggesting that it is not associated with any one form of immunization, but is instead a general mechanism of CD8+ T cell destruction. We were thus interested in dissecting the mechanism by which the liver sequesters activated CD8+ T cells, and the signals that are required for such organ-specific retention of the cells. Trafficking of cells to the nonlymphoid tissues is a multistep process, mediated through interaction of adhesion molecules expressed on the surface of the cells with their counter-receptors expressed on the vasculature (9). The first step in the recruitment of lymphocytes from the circulation involves rolling and tethering, mediated through the selectin-addressin system (10). The integrins then come into play during extravasation and firm adhesion of the cells to the tissues (9). The vascular architecture of the liver is unique, and this predisposes it to be a trapping site for lymphocytes (3). In the liver, blood flows through sinusoidal spaces rather than capillaries, and the large cross-sectional area of the sinusoids results in a low blood flow rate, which eliminates the requirement for selectin-mediated rolling and tethering of the leukocytes. The unimpaired trapping of cells (CD8+ T cells and neutrophils) in the livers of E and P selectin-deficient mice (11, 12) provides experimental evidence for the minimal role of selectins in this process. In other tissues, there is a continuous endothelial cell layer and a basement membrane separating the parenchymal cells from the circulating leukocytes, but in the liver the endothelial barrier of liver sinusoidal endothelial cells (LSECs)3 is fenestrated (13, 14), thus providing the opportunity for direct interaction of the circulating cells with the underlying hepatocytes (15). The integrins ICAM-1, VCAM-1, and vascular adhesion protein-1 (VAP-1) are expressed at higher levels in the liver than in other tissues, making them possible candidates for the trapping mechanism. Although ICAM-1 is constitutively expressed on hepatocytes, LSECs, and Kupffer cells, VCAM-1 and VAP-1 are mainly expressed by the LSECs (4). The higher level of adhesion molecule expression in the liver may be in response to LPS originating from the gut flora. Such LPS may enter the liver via the portal vein (16). Of these three potential adhesion mechanisms, the ICAM-1 interaction provides an explanation for the preferential accumulation of activated CD8+ T cells in the liver. This is because LFA-1, the counter-receptor for ICAM-1, is expressed by activated CD8+ T cells at a higher level than activated CD4+ T cells (8). In isolated liver perfusion experiments, ICAM-1-deficient livers accumulated fewer activated CD8+ T cells than control livers (8), and during LCMV infection the migration of activated CD8+ T cells to the liver and other sites of infection was inhibited in the absence of ICAM-1 (11). 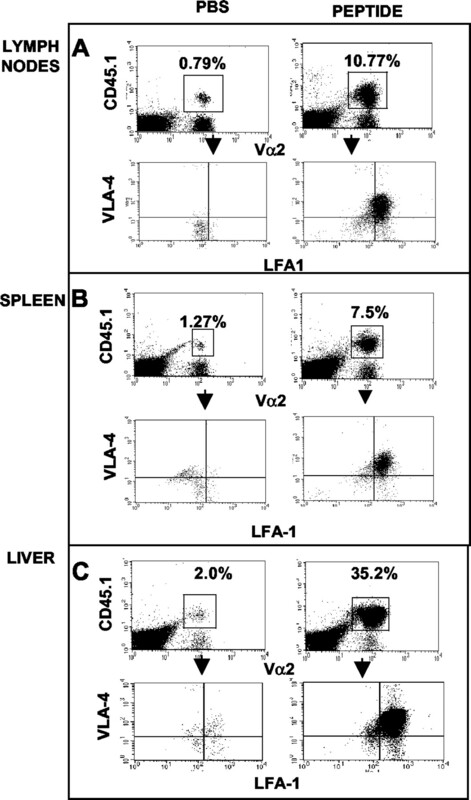 Other in vitro studies have indicated that the VCAM-1 present on LSECs has an important role in adhesion in the liver, which is mainly mediated through interaction with very late Ag-4 (VLA-4) present on the leukocytes. Binding of lymphocytes to hepatic endothelium could be blocked in vitro by anti-VCAM-1 Abs (17). In different systems the relative importance of these adhesion mechanisms varied (18, 19). Ag presentation by LSECs and hepatocytes in the liver has also been shown to be important for trapping activated CD8+ T cells in the liver (7). However, the issue of how local Ag recognition regulates the different adhesion molecules is still not understood. The affinity of the LFA-1/ICAM-1 interaction increases transiently with TCR ligation, and this is mediated through phosphoinositol 3-kinase activity (20). In contrast, TCR signaling does not regulate VLA-4 integrin affinity, although the high affinity form of VLA-4 is expressed upon activation (21). In this study we show that ICAM-1 and VCAM-1 are together the main mechanism by which the liver traps activated CD8+ T cells. The mechanisms of action of the two adhesion molecules, however, are different. ICAM-1-mediated adhesion requires local Ag presentation, which we think acts through TCR signaling to maintain the LFA-1 on T cells in a high affinity form. In contrast, VCAM-1-mediated trapping does not require any local Ag presentation. Nontransgenic C57BL/6J and C57BL/6J-Icam1tm1Bay (ICAM-1−/−) mice were purchased from The Jackson Laboratory (Bar Harbor, ME) and housed in a specific pathogen-free environment in compliance with institutional guidelines for animal care. A colony of OT1 transgenic mice was maintained on a CD45.1 background. B6.C-H-2bm8 (bm8) mice were a gift from L. R. Pease (Mayo Clinic, Rochester, MN). All mice were used between 6 and 8 wk of age. Six- to 8-wk-old mice were irradiated with 1000 rad (10 Gy) as a single dose from an RS2000 x-ray irradiator (Rad Source; Rad Source Technologies, Coral Springs, FL) and used as recipients. Mature T cells were depleted from donor bone marrow cell suspensions by complement-mediated lysis, and 10 × 106 T cell-depleted bone marrow cells were injected i.v. within 4–6 h of irradiation. The chimeras were allowed to reconstitute for 30 days before being used for experiments. Donor cells were of the CD45.1 allotype, and the recipients were on a CD45.2 background; thus, the extent of reconstitution could be examined. Two types of chimeras were made: B6→B6 and B6→bm8. Spleen and peripheral lymph nodes were harvested from OT1 TCR transgenic mice, and single-cell suspensions were obtained by mechanical homogenization of the tissues. RBCs were removed by density gradient centrifugation (Lympholyte-M; Cedarlane Laboratories, Ontario, Canada). CD8+ T cells were purified by depletion of the MHC class II-positive dendritic cells, B cells, and macrophages using an Ab mixture (clone 212.A1 specific for MHC class II molecules, clone 2.4-G2 specific for FcRs, clone TIB 146 specific for B220, clone GK1.5 specific for CD4, and clone HB191 specific for NK1.1 marker). Magnetic beads coated with the secondary Abs (Biomag goat anti-rat IgG, goat anti-mouse IgG, and goat anti-mouse IgM; Qiagen, Valencia, CA) were used to remove the cells coated with the primary Abs. Five million OT1 T cells (>90% pure CD8+ T cells) were injected i.v. into recipient mice. The mice were activated with daily i.p injections of 25 nmol of SIINFEKL peptide (New England Peptide, Fitchburg, MA) for 3 days starting 24 h after injection of OT1 cells. Blocking Abs against ICAM-1 (clone 3E2), VCAM-1 (clone 429), and H-2Db (clone 28-14-8) were purchased from BD PharMingen (San Diego, CA). The isotype controls hamster IgG1 (clone G235-2356) and rat IgG2a (clone R35-95) were also purchased from BD PharMingen. One hundred micrograms of each Ab was injected i.p on day 3 after the first injection of peptide. Peripheral lymph nodes and spleens were isolated from mice on day 4 after the first injection of peptide. Single-cell suspensions were made by mechanical homogenization using frosted glass slides. Intrahepatic lymphocytes were isolated from liver using a standard protocol (13). Briefly, the livers were perfused with PBS, dissected out of the abdominal cavity, and homogenized using a sieve and plunger. The homogenized liver was washed once followed by digestion with serum-free RPMI 1640 containing 0.05% collagenase IV (Sigma-Aldrich, St. Louis, MO) and 0.002% DNase I (Sigma-Aldrich) at 37°C for 40 min. Low speed centrifugations (30 × g for 3 min at 4°C) were used to remove the majority of the hepatocytes. The supernatant was then centrifuged at 120 × g for 10 min to obtain a pellet of cells containing mostly intrahepatic lymphocytes together with Kupffer cells and the remaining hepatocytes. The cells were resuspended with RPMI 1640 to a final volume of 1 ml and mixed with 4 ml of 30% metrizamide (ICN Biomedicals, Aurora, OH) resulting in a 5-ml cell suspension of 24% metrizamide. This cell suspension was layered under 1 ml of serum-free medium and centrifuged at 1500 × g for 20 min at 4°C. The cells at the interface were collected, washed with PBS, and counted before they were stained and analyzed. Caspase-3 activity was measured using a CaspaTag caspase-3 (DEVD) activity kit (Intergen, Purchase, NY) using the manufacturer’s instructions. Stained cells were analyzed on a FACScan or FACSCalibur (BD Biosciences, San Jose CA). Data were analyzed using CellQuest software (BD Biosciences). Data were pooled from multiple experiments, and the Student t test (unpaired, two-tailed) was used to measure the significance of the differences observed between the test groups. Accumulation of activated CD8+ T cells in the liver during peripheral deletion was observed previously in an adoptive transfer model using OT1 TCR transgenic cells (7). The deletion of activated CD8+ T cells from the periphery in this model coincided with their accumulation in the liver, suggesting that cells that are activated in the periphery migrate to the liver and are trapped there. We were interested in identifying the adhesion mechanisms that the liver uses to trap these activated CD8+ T cells. When purified OT1 TCR transgenic CD8+ T cells (>90% purity) were injected i.v. into B6 recipients, and these were injected with the SIINFEKL antigenic peptide, there was expansion of OT1 T cells in all compartments and a significant accumulation in the liver on day 4 (Fig. 1⇓). Upon activation with antigenic peptide, the majority of the OT1 T cells up-regulated LFA-1 and VLA-4 on their surface (Fig. 1⇓). LFA-1 and VLA-4 are uniformly up-regulated on all OT1 cells upon activation. 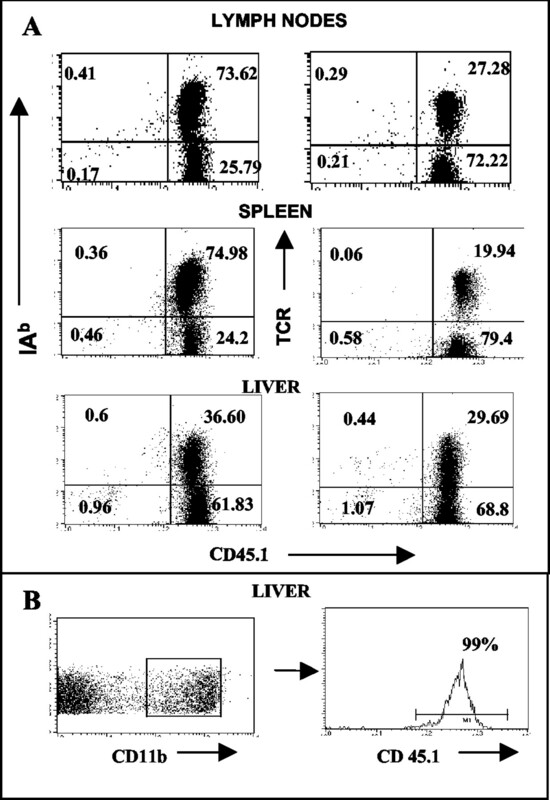 The percentage of transferred OT1 transgenic cells (CD45.1+Vα2+) in the lymph nodes (A), spleen (B), and liver (C) of mice treated with peptide (SIINFEKL) or PBS is shown in the top two panels for each organ. LFA-1 and VLA-4 expressions on the gated CD45.1+Vα2+ population are shown in the bottom two panels of each section. The data show individual representative mice in each group. The experiment was repeated more than three times, with three mice per treatment group. As the liver expresses the adhesion molecules ICAM-1 and VCAM-1 at higher densities than other tissues, and the counter-receptors LFA-1 and VLA-4 are expressed on the OT1 T cells upon activation, we wanted to test whether blocking ICAM-1 or VCAM-1 in this adoptive transfer model would affect accumulation of T cells in the liver. Blocking Abs against ICAM-1 and VCAM-1 were used for this purpose. To avoid any effects of the blocking Abs on priming of OT1 cells, they were injected 3 days after Ag, a time when expansion of the OT1 cells in the periphery was complete, and deletion had already commenced. This time point was chosen based on the kinetics of expansion of the OT1 cells established previously (7). When the blocking Abs against ICAM-1 or VCAM-1 were used on day 3 (i.e., 72 h after the first injection of SIINFEKL peptide), in each case there was an almost 2-fold reduction in the percentage of activated OT1 cells that accumulated in the liver 18–24 h later (Fig. 2⇓, A and B, left panels). This reduction was highly significant both with anti-ICAM-1 (p = 0.002) and with anti-VCAM-1 (p = 0.004). The effect of the blocking Abs was also apparent in terms of reduction in the total numbers of OT1 cells in the liver (Fig. 2⇓, A and B, right panels). The extent of inhibition in accumulation of OT1 cells was not different with the two Abs (p > 0.542). The blocking effect of the anti-ICAM-1 and anti-VCAM-1 Abs was liver specific, as there was no significant reduction in the spleen (p > 0.1)) or the lymph nodes (p > 0.2) with either of the Abs (Fig. 2⇓, A and B). The decrease in the number of OT1 cells in the liver in the presence of the blocking Abs was not compensated by their increase in the spleen or lymph nodes, suggesting that the cells that fail to get trapped in the liver do not recirculate back to the spleen or lymph nodes. When the two Abs were used in combination, they had an additive effect in the liver (Fig. 2⇓C). There was, however, a little binding (<10% of total) that was seen in the liver even with the two Abs used together (Fig. 2⇓C) that could be due to adhesion mediated through VAP-1 (18). The accumulation of activated OT1 cells in the liver is blocked in the presence of anti-ICAM-1 or anti-VCAM-1 blocking Abs. A, Average percentages and cell numbers (±SE) of OT1 cells in the spleen (□), lymph nodes (▪), and livers (▧) of mice treated with PBS, SIINFEKL peptide, or peptide with anti ICAM-1/hamster IgG. The percentages (left) and numbers (right) of mice treated with the anti-VCAM-1 blocking Ab or rat IgG is shown in B. C, Anti-ICAM-1 and anti-VCAM-1 Abs were used in combination. Also shown in C is the control group, which received anti-H-2Db Ab. There were six mice per group in each of the panels. The isotype controls for the blocking Abs against ICAM-1 and VCAM-1 that were used were hamster IgG and rat IgG, respectively. Neither of the isotype controls caused any significant reduction in either cell numbers or percentages of OT1 cells that accumulated in the spleen, lymph nodes, or liver (p > 0.1). This excludes the possibility that the reduction in accumulation of OT1 seen in the liver with the anti-ICAM-1 and anti-VCAM-1 Abs was due to any cytopathic effect mediated through FcR binding. As activated T cells express ICAM-1 themselves, we reasoned that an inert isotype-matched Ab would not be the only appropriate control. An Ab against the MHC class I molecule, H-2Db, was selected as an additional control on the basis that it would bind to the T cells, but not affect Ag presentation. H-2Db is a nonrestricting MHC class 1 molecule for the presentation of SIINFEKL peptide to OT1 T cells. There was no difference in the accumulation of OT1 cells in the livers of mice that received only antigenic peptide or antigenic peptide with this control Ab (p > 0.45; Fig. 2⇑C). This argues that the effects of anti-ICAM-1 and anti-VCAM-1 Abs are not due simply to Ab binding to the T cells. The activated OT1 T cell population was more or less homogenous with respect to the expression of LFA-1. The OT1 cells that proliferated in response to the antigenic peptide down-regulated CD62L and up-regulated CD44 in the spleen, lymph nodes, and liver, indicating that they were activated (Fig. 3⇓, top two rows). This pattern of expression of the activation markers CD62L and CD44 did not change significantly in the presence of anti-ICAM-1 and anti-VCAM-1 Abs (Fig. 3⇓, bottom two rows). Thus, the activation of OT1 cells in the spleen and lymph nodes was not affected by the presence of the blocking Abs. Blocking Abs against ICAM-1 or VCAM-1 do not affect the activation status of the OT1 cells. 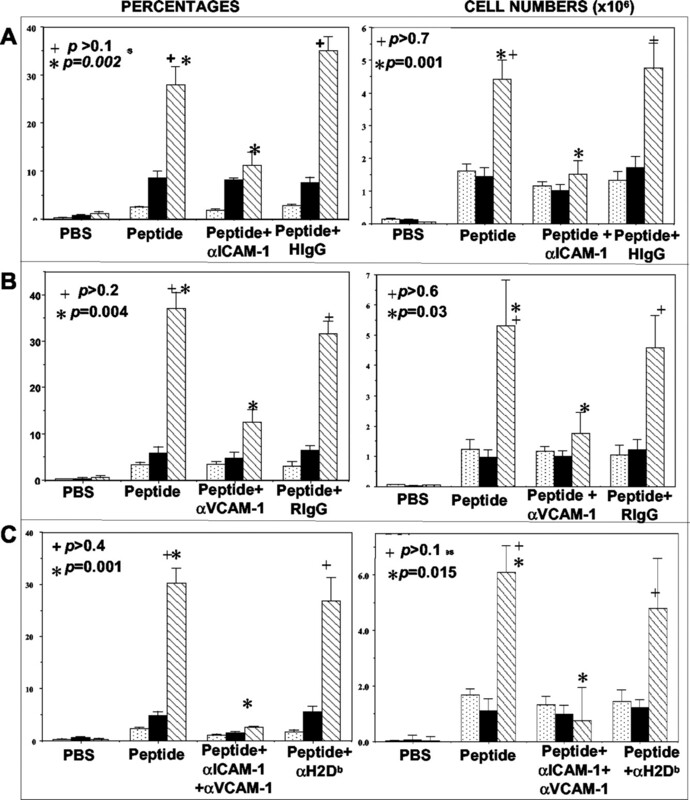 The data show the percentage of transferred OT1 (CD45.1+Vα2+) cells in the spleen, lymph nodes, and liver of mice treated with PBS, SIINFEKL peptide, peptide with anti-ICAM-1 blocking Ab, or peptide with anti-VCAM-1 blocking Ab. 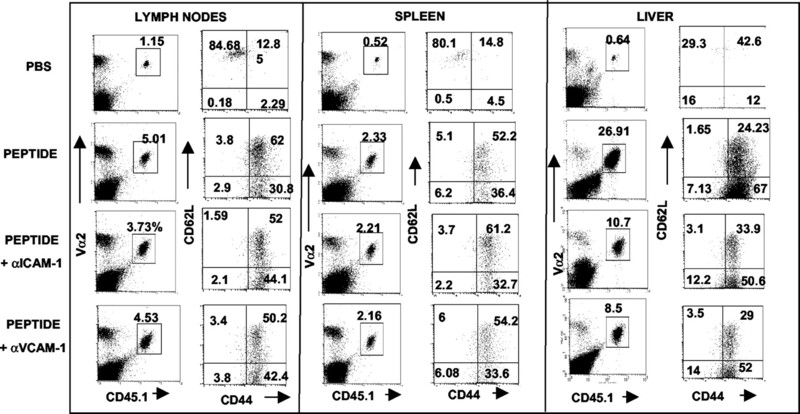 The expression of CD62L and CD44 on the CD45.1/Vα2-gated populations in each of the experimental groups is also shown. The data are from one representative mouse per group. There were >15 mice/treatment group (from multiple experiments). To test for subtle effects of the blocking Abs on T cell proliferation, OT1 cells were labeled with CFSE before transfer. In the presence of antigenic peptide, the CFSE labeled OT1 cells divided synchronously, and by day 4 almost all the cells had lost CFSE (data not shown). The presence of anti-ICAM-1 or anti-VCAM-1 Abs did not affect the proliferation of OT1 cells in the lymph nodes, spleen, or liver, as evident from the lack of difference in the dilution of CFSE seen with and without the blocking Abs. We conclude that the difference in the percentage of activated OT1 T cells that we see in the liver when ICAM-1 or VCAM-1 is blocked is not because of differences in proliferation. The percentage of OT1 T cells in the liver could be less with the Ab treatments due to either a defect in the expansion of the cells or an increased death rate. As the rate of division was similar with and without the blocking Abs, the percentage of dying cells was estimated by measuring caspase-3 activity. As caspase-3 is downstream of both the active (death receptor-mediated) and passive (mitochondrial) death pathways, it gives an indication of total apoptosis regardless of the mechanisms. The percentage of the transferred OT1 cells that showed caspase-3 activity, measured using a fluorogenic substrate, increased upon activation with antigenic peptide, but did not differ in the presence of the blocking anti-ICAM-1 or anti-VCAM-1 Abs (Fig. 4⇓). As neither cell death nor proliferation was being severely compromised, the reduction in the percentages (and total cell numbers) of OT1 cells that accumulated in the liver in the presence of anti-ICAM-1 or anti-VCAM-1 Abs appeared to be due to an effect on trafficking of these cells. The blocking Abs do not affect the rate of apoptosis of the activated cells in spleen, lymph nodes, or liver. Caspase-3 activity was detected using a fluorogenic substrate for activated caspase-3 (FAM-DEVD-FMK). A, Caspase-3 staining on the gated CD45.1+Vα2+ cells in lymph nodes, spleen, and liver of one representative mouse per experimental group (n = 9). B, Average percentages (±SE) of OT1 cells that showed caspase-3 activity in spleens (□), lymph nodes (▪), and livers (▧) of mice from the various treatment groups. Ag presentation in the liver is important for trapping OT1 cells (7), and in this study we have shown that the adhesion molecules ICAM-1 and VCAM-1 are crucial for the liver to trap activated CD8+ T cells. It was thus important to address the issue of the relationship between Ag recognition and adhesion events. To do this, radiation chimeras were constructed using T-depleted bone marrow cells from B6 mice as the donor and lethally irradiated Kb mutant bm8 mice or control B6 mice as the recipients. In bm8 mice, the mutated H-2Kb molecules are incapable of presenting the SIINFEKL antigenic peptide. Thus, in a B6→bm-8 radiation chimera, only the bone marrow-derived APCs, including dendritic cells and Kupffer cells, are capable of presenting Ag. In such chimeras, non-bone marrow-derived liver cells (hepatocytes and LSECs) cannot present Ag. The donor cells in these bone marrow transfers were of the CD45.1 allotype, and they were injected into recipients on the CD45.2 background, thus allowing us to estimate the extent of chimerism. The efficiency of reconstitution was between 90 and 99%, based on the percentage of CD45.1 cells in the different organs 30 days after irradiation and transfer (Fig. 5⇓A). The degree of reconstitution of the Kupffer cells in the liver after irradiation and reconstitution was >95%, based on CD45.1 staining of CD11b+ cells in the liver cell suspension (Fig. 5⇓B). Reconstitution of the radiation bone marrow chimeras. A, Replacement of the MHC class 11+ (IAb) and TCR+ cells with donor cells (CD45.1) in spleen, lymph nodes, and liver of the bone marrow chimeras. B, Reconstitution of Kupffer cells in the liver. The histogram shows the percentage of CD45.1 cells of CD11b+-gated cells in the liver. When the B6→bm8 chimeras were given OT1 cells, and these T cells were activated with antigenic peptide in vivo, they showed a 2-fold reduction in the percentage of cells that accumulated in the liver compared with the B6→B6 chimeras (p = 0.0016; Fig. 6⇓A). The reduction was also apparent in terms of the total numbers of OT1 cells that accumulated in the livers of the two different types of chimeras (Fig. 6⇓B). This confirms earlier data with B6→bm1 (another Kb mutant mouse strain that cannot present SIINFEKL) chimeras, where the lack of Ag presentation by the non-bone marrow-derived liver cells resulted in a reduction in the accumulation of activated OT1 cells in the liver. In the B6→bm8 chimeras, priming was not compromised because there was no significant difference (p > 0.06) between the cells that accumulated in the spleen or lymph nodes of the B6→bm8 and B6→B6 chimeras. The activation pattern (CD44 up-regulation and CD62L down-regulation) was also comparable (data not shown) between the two types of chimeras in the different organs tested (spleen, lymph nodes, and liver). In the absence of Ag presentation in the liver, anti-ICAM-1 Ab has no effect, whereas anti-VCAM-1 Ab can still block hepatic accumulation. The average percentage (A) and numbers (B) of OT1 cells in spleen (□), lymph nodes (▪), and liver (▧) of B6→B6 bone marrow chimeras or B6→bm8 bone marrow chimeras treated with antigenic peptide with or without the ICAM-1 or VCAM-1 blocking Abs. The data were pooled from three separate experiments with three mice per group (n = 9). 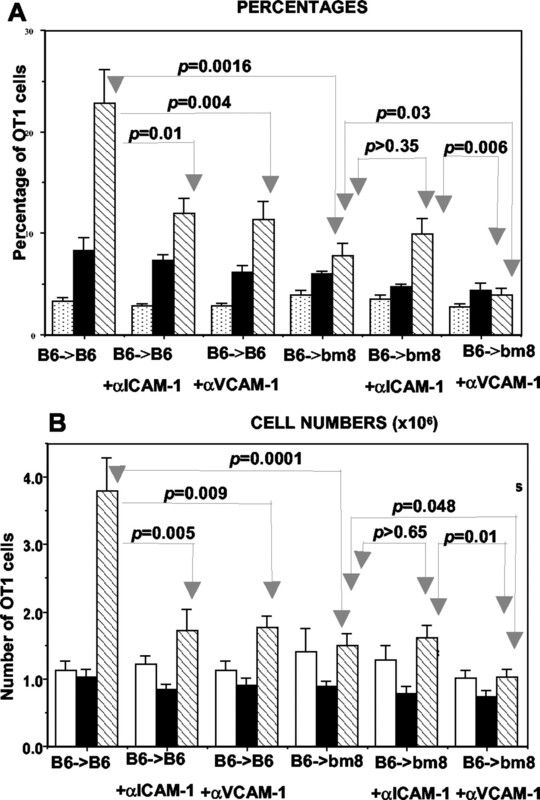 The effect of blocking ICAM-1 or VCAM-1 on hepatic accumulation of activated OT1 cells in B6→B6 chimeras was identical with the effect seen in wild-type B6 mice (compare Figs. 2⇑ and 6⇑). Both the Abs caused a significant reduction in the percentage (Fig. 6⇑A) and number (Fig. 6⇑B) of cells that accumulated in the liver of the B6→B6 chimeras (p < 0.004 in both cases). However, when there was no Ag presentation by the non-bone marrow-derived liver cells (in the B6→bm8 chimera), the blocking Abs had different effects. Blocking VCAM-1 still caused a reduction in the accumulation of cells in livers of the B6→bm8 chimeras (p = 0.03), suggesting that the VCAM-1-mediated block was independent of the presentation of Ag. In contrast, blocking ICAM-1 did not have any effect on the accumulation of cells in the livers of the B6→bm8 chimeras (p > 0.3). The ICAM-1-mediated adhesion was thus dependent on Ag presentation in the liver. The effect of Ag recognition might be to increase the affinity of LFA-1 on the T cells through TCR-mediated signaling, thus strengthening the ICAM-1/LFA-1 interaction in the liver. The liver functions as a tolerizing organ, which is beneficial in therapeutic liver transplantation, but can be detrimental when the liver fails to generate protective immune responses against local pathogens such as hepatitis C virus (22). The mechanisms by which the liver traps activated CD8+ T cells and the signals that it delivers to these cells thus determine the nature of the local immune response. The adoptive transfer model using OT1 cells allowed us to track the migration of large numbers of activated CD8+ T cells into different compartments and investigate the roles of different adhesion molecules in this process. As ICAM-1 has costimulatory functions (23), the use of ICAM-1-deficient mice as recipients in the adoptive transfer model resulted in compromised priming (our unpublished observations from preliminary experiments), which made it difficult to address the role of ICAM-1 in leukocyte trafficking. As an alternate strategy we used blocking Abs, and they were administered at a time point when the priming of the OT-1 T cells in the lymph nodes was complete, and deletion from the periphery was beginning. Several recent reports have proposed that the CD8+ T cell differentiation process is programmed and that a very brief period of exposure to Ag (∼24 h) is sufficient to cause naive CD8+ T cells to become committed to clonal expansion and differentiation into cytotoxic effectors (24, 25). In our system the administration of blocking Abs 72 h after the first injection of peptide did not have any effect on the rate of proliferation or the activated phenotype of the OT1 cells, suggesting that priming was not affected. As the rate of apoptosis was also not affected, we conclude that the reduction in the percentage of cells seen in the liver in the presence of the blocking Abs was an effect on trafficking of cells to the liver. Ag presentation and ICAM-1 had been implicated separately in the hepatic trapping of CD8+ T cells. Hence, it was important to understand the interaction between the two mechanisms. The construction of bone marrow chimeras in which parenchymal cells and the liver vasculature are not capable of presenting Ag provided a tool to examine the role of Ag presentation and adhesion. The blocking Abs against ICAM-1 did not have an effect on the accumulation of cells in the liver when Ag presentation by non-bone marrow-derived liver cells could not occur. This suggests that the adhesion through ICAM-1 may be mediated through the same cells that present the Ag in the liver. Radiation chimeras were also made where the non-bone marrow-derived liver cells do not express ICAM-1 (B6→ICAM-1−/− chimeras). In such chimeras, the lack of ICAM-1 on the non-bone marrow-derived liver cells caused a reduction in accumulation of activated OT1 cells, and the extent of reduction was ∼50%, comparable to that seen in the absence of Ag presentation by the same cells (data not shown). This further supports our conclusion that the ICAM-1-mediated trapping of cells in the liver is dependent on Ag presentation by the non-bone marrow-derived liver cells. This conclusion stands in apparent conflict with our earlier data (8), suggesting that the expression of ICAM-1 in the liver was important in the trapping of CD8+ T cells activated by anti-CD3. In such a model, one would expect that there would be no Ag presentation by the liver itself; our model would therefore predict that VCAM-1, but not ICAM-1, would be the major mechanism of trapping. One possible reason for this apparent discrepancy is that the anti-CD3 on the activated T cells was engaging FcRs in the liver, perhaps on Kupffer cells, and that this was increasing the avidity of their LFA-1 molecules. Alternately, this perfusion model might be detecting a role for short term, low avidity LFA-1/ICAM-1 interactions in initial trapping, whereas the in vivo experiments in the current study reveal the effects of high avidity LFA-1/ICAM-1 interactions in stable CD8+ T cell accumulation. The current working model for how activated CD8+ T cells become trapped in the liver involves two steps. 1) T cells that are activated in the spleen and lymph nodes circulate through the liver, where they are initially sequestered by passive adhesion mechanisms, such as the VCAM-1/VLA-4 or VAP-1/VAP-1 receptor interactions. 2) Once these cells recognize Ag on the surface of the hepatocytes or LSECs, there is stabilization of the interactions brought about by an increase in affinity of the ICAM-1/LFA-1 interaction. Thus, Ag presentation increases the residence time of the activated CD8+ T cells in the liver, mainly by increased adhesion through ICAM-1. There have been some recent reports to suggest that memory responses might be compartmentalized (2, 26). The activated CD8+ T cells that migrate to different nonlymphoid organs have different rates of apoptosis compared with cells that traffic to the lymph nodes or spleen, suggesting that there might be different pools of memory populations (2). It has also been observed that the memory cells isolated from nonlymphoid compartments show lytic activity directly ex vivo in contrast to their splenic counterparts, suggesting that the former are better poised to respond in the event of infections (26). Although in our system the mode of immunization (peptide in saline) does not provide sufficient costimulation for the generation of memory responses, these findings can be extrapolated to make predictions for more physiological situations, such as infection at extrahepatic sites. During influenza infection, the primary site of the Ag is the lung. After the Ag has been cleared from the system, the cells traffic to the liver even in the absence of local Ag (5). Based on our findings, we predict that the main adhesion mechanism keeping these cells in the liver would be VCAM-1. This should hold true whenever the liver sequesters activated CD8+ T cells that are activated at an extrahepatic site. Experimental hepatitis models such as Con A-induced hepatitis have shown a strong up-regulation of ICAM-1 and VCAM-1 in the liver, which has an effect on the accumulation of CD4+ T cells (27, 28). TNF-α (which is elevated in acute and chronic liver diseases such as hepatitis B and C (29)) has also been known to up-regulate the expression of both ICAM-1 and VCAM-1 in the liver, primarily through its interaction with TNF receptor 1. However, the relative importance of the two different adhesion mechanisms for accumulation of activated CD8+ T cells in such models will depend on the local availability of Ag. Adhesion mechanisms may be relevant to disease under conditions where liver damage is mediated by activated CD8+ T cells. 1 This work was supported by National Institutes of Health Grant RO1AI37554. 3 Abbreviations used in this paper: LSEC, liver sinusoidal endothelial cell; VAP-1, vascular adhesion protein-1; VLA-4, very late Ag-4. Topham, D. J., I. N. Crispe. 2003. Contrasting urban and rural lifestyles of memory CD8+ T cells. Immunity 18:584. Wang, X. Z., S. E. Stepp, M. A. Brehm, H. D. Chen, L. K. Selin, R. M. Welsh. 2003. Virus-specific CD8 T cells in peripheral tissues are more resistant to apoptosis than those in lymphoid organs. Immunity 18:631. Crispe, I. N., T. Dao, K. Klugewitz, W. Z. Mehal, D. P. Metz. 2000. The liver as a site of T-cell apoptosis: graveyard, or killing field?. Immunol. Rev. 174:47. Park, S., D. Murray, B. John, I. N. Crispe. 2002. Biology and significance of T-cell apoptosis in the liver. Immunol. Cell. Biol. 80:74. Belz, G. T., J. D. Altman, P. C. Doherty. 1998. Characteristics of virus-specific CD8+ T cells in the liver during the control and resolution phases of influenza pneumonia. Proc. Natl. Acad. Sci. USA 95:13812. Dao, T., M. Exley, W. Z. Mehal, S. M. Tahir, S. Snapper, M. Taniguchi, S. P. Balk, I. N. Crispe. 2001. Involvement of CD1 in peripheral deletion of T lymphocytes is independent of NK T cells. J. Immunol. 166:3090. Mehal, W. Z., F. Azzaroli, I. N. Crispe. 2001. Antigen presentation by liver cells controls intrahepatic T cell trapping, whereas bone marrow-derived cells preferentially promote intrahepatic T cell apoptosis. J. Immunol. 167:667. Mehal, W. Z., A. E. Juedes, I. N. Crispe. 1999. Selective retention of activated CD8+ T cells by the normal liver. J. Immunol. 163:3202. Springer, T. A.. 1994. Traffic signals for lymphocyte recirculation and leukocyte emigration: the multistep paradigm. Cell 76:301. Ley, K., D. C. Bullard, M. L. Arbones, et al 1995. Sequential contribution of L- and P-selectin to leukocyte rolling in vivo. J. Exp. Med. 181:669. Bartholdy, C., O. Marker, A. R. Thomsen. 2000. Migration of activated CD8+ T lymphocytes to sites of viral infection does not require endothelial selectins. Blood 95:1362. Wong, J., B. Johnston, S. S. Lee, D. C. Bullard, C. W. Smith, A. L. Beaudet, P. Kubes. 1997. A minimal role for selectins in the recruitment of leukocytes into the inflamed liver microvasculature. J. Clin. Invest. 99:2782. Knolle, P. A., A. Limmer. 2001. Neighborhood politics: the immunoregulatory function of organ-resident liver endothelial cells. Trends Immunol. 22:432. Wisse, E., F. Braet, D. Luo, R. De Zanger, D. Jans, E. Crabbe, A. Vermoesen. 1996. Structure and function of sinusoidal lining cells in the liver. Toxicol. Pathol. 24:100. Bertolino, P., G. W. McCaughan, D. G. Bowen. 2002. Role of primary intrahepatic T-cell activation in the “liver tolerance effect.”. Immunol. Cell. Biol. 80:84. Komatsu, S., R. D. Berg, J. M. Russell, Y. Nimura, D. N. Granger. 2000. Enteric micro flora contribute to constitutive ICAM-1 expression on vascular endothelial cells. Am. J. Physiol. 279:G186. Papadimitriou, M. N., D. G. Menter, K. Konstantopoulos, G. L. Nicolson, L. V. McIntire. 1999. Integrin α4β1/VCAM-1 pathway mediates primary adhesion of RAW117 lymphoma cells to hepatic sinusoidal endothelial cells under flow. Clin. Exp. Metastasis 17:669. Lalor, P. F., S. Edwards, G. McNab, M. Salmi, S. Jalkanen, D. H. Adams. 2002. Vascular adhesion protein-1 mediates adhesion and transmigration of lymphocytes on human hepatic endothelial cells. J. Immunol. 169:983. Thatte, J., V. Dabak, M. B. Williams, T. J. Braciale, K. Ley. 2003. LFA-1 is required for retention of effector CD8 T cells in mouse lungs. Blood 101:4916.
van Kooyk, Y., P. van de Wiel-van Kemenade, P. Weder, T. W. Kuijpers, C. G. Figdor. 1989. 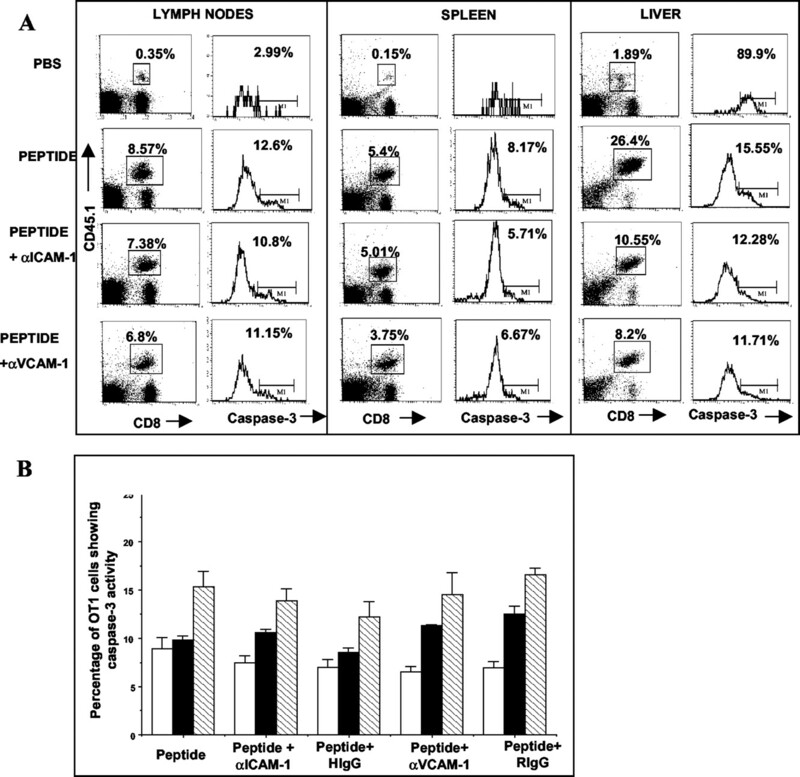 Enhancement of LFA-1-mediated cell adhesion by triggering through CD2 or CD3 on T lymphocytes. Nature 342:811. Feigelson, S. W., V. Grabovsky, E. Winter, L. L. Chen, R. B. Pepinsky, T. Yednock, D. Yablonski, R. Lobb, R. Alon. 2001. The Src kinase p56lck up-regulates VLA-4 integrin affinity: implications for rapid spontaneous and chemokine-triggered T cell adhesion to VCAM-1 and fibronectin. J. Biol. Chem. 276:13891. Spengler, U., M. Lechmann, B. Irrgang, F. L. Dumoulin, T. Sauerbruch. 1996. Immune responses in hepatitis C virus infection. J. Hepatol. 24:20. Deeths, M. J., M. F. Mescher. 1999. ICAM-1 and B7-1 provide similar but distinct costimulation for CD8+ T cells, while CD4+ T cells are poorly costimulated by ICAM-1. Eur. J. Immunol. 29:45. Kaech, S. M., R. Ahmed. 2001. Memory CD8+ T cell differentiation: initial antigen encounter triggers a developmental program in naive cells. Nat. Immunol. 2:415. Kaech, S. M., R. Ahmed. 2003. CD8 T cells remember with a little help. Science 300:263. Masopust, D., V. Vezys, A. L. Marzo, L. Lefrancois. 2001. Preferential localization of effector memory cells in nonlymphoid tissue. Science 291:2413. Tiegs, G., J. Hentschel, A. Wendel. 1992. A T cell-dependent experimental liver injury in mice inducible by concanavalin A. J. Clin. Invest. 90:196. Wolf, D., R. Hallmann, G. Sass, M. Sixt, S. Kusters, B. Fregien, C. Trautwein, G. Tiegs. 2001. TNF-α-induced expression of adhesion molecules in the liver is under the control of TNFR1: relevance for concanavalin A-induced hepatitis. J. Immunol. 166:1300. Spengler, U., R. Zachoval, H. Gallati, M. C. Jung, R. Hoffmann, G. Riethmuller, G. Pape. 1996. Serum levels and in situ expression of TNF-α and TNF-α binding proteins in inflammatory liver diseases. Cytokine 11:864.